It’s that time of year . . . when those with green fingers are outdoors, on their hands & knees, getting their hands dirty, and either weeding or busily planting for the new growing season. I’m not one of those people. I enjoy sitting out in the garden, but I leave all the work to the husband. I also enjoy eating fresh home-grown veggies, but again, I leave that to the husband. It’s still a little early in the season to be planting certain crops, but we have begun enjoying a few home-grown vegetables . . . ones that survive from one year to the next. The newest growing experiment here is: asparagus. The husband and a neighbour decided, last year, that they were going to give asparagus a go. They therefore bought in loads of sand last summer, to build their sand mounds and bought some asparagus plants that were already a couple of years old (if I followed the proceedings correctly). Anyway, despite hens escaping and having fun in the sand earlier this month . . . and despite Ducky enjoying a sand bath too . . . the husband (and neighbour) have been comparing sand mounds and counting all the shoots coming through. We’ve already enjoyed four (very modest) harvests. Here’s a batch, fresh from the sand. Another survivor, despite hens reeking havoc, is the chard. That was planted from seed last Spring, and we enjoyed a healthy harvest last year. The husband left it in the ground over the winter months. The hens pecked it half to death in March . . . but now hens can no longer escape, the chard is flourishing . . . and how lovely it is, just to wander out and harvest just enough fresh veg for a healthy dinner for two. So, plenty of greens in the veggie garden . . . and a little bit of greenery indoors too. We redecorated our living room late Feb to early March. Nothing very exciting. Just ripping off old wall paper, then giving walls a coat of white paint, and painting the ceiling inbetween wooden beams. Once that was done, everything looked very white, and a little bare . . . so the husband had fun with some paper napkins. They were my idea, as was the ivy motif, but it was the husband who did the actual work. My job was supposed to be making new covers for our sofas. That started off well, but then I stalled. It’s something I need to get motivated about, but I seem to have found other things to distract me since! On 9th of this month, I showed you my first ever sewing project with sleeves and a collar. Well, I was so pleased with how it turned out, I was raring to make a second one. For my second version, I went for the rounded shirt tails, on both front & back, but kept sleeves as 3/4 and the grandad style collar. And just to make things a little different, I decided to use a white “piqué” cotton for the collar, front yokes and the button loopy bits. 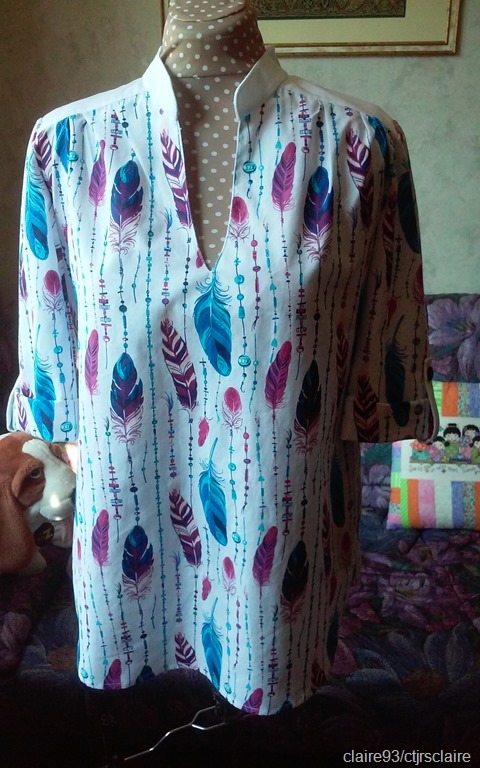 Main fabric is a very fun feather print . 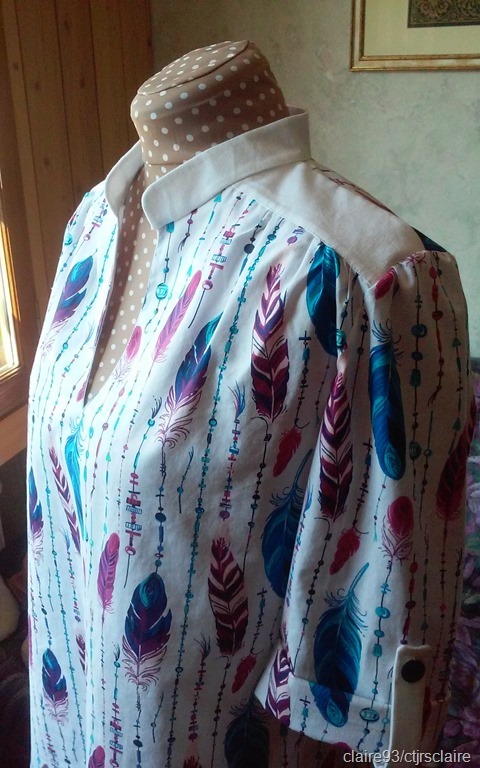 . . hence the Indian name for this new version of the shirt: “Dances with hens” lol. I really love it! It looks so different from the first version, because of the bright colours. Just look how cleverly the feathers match up when sleeves are rolled! Everything went ever so smoothly this time around. Collar went on first time. Sleeve insertion was still rather daunting, but I’d done it before, so I knew I could do it again. Overall, it really was a joy to make and I am already planning on making it a third time! I’m even toying with the idea of making the proper pointy collar of version B for my next attempt, despite having said that I don’t like pointy collars. Definitely won’t be adding a pocket or going for the full length sleeves though. Followers know that I became a grandma in August last year, to a bonny baby girl, who I have nick-named Baby Viking, because her dad, our second son, is known here as Daddy Viking. Well, in true grandma form, I made some presents to celebrate the birth: quilt, cloth book, crinkle toy, crocheted bear and a couple of bibs. I then knitted up 2 very cheerful bolero cardies, as an excuse to get some practice knitting in February. Since then, I have been busy at my sewing machine. 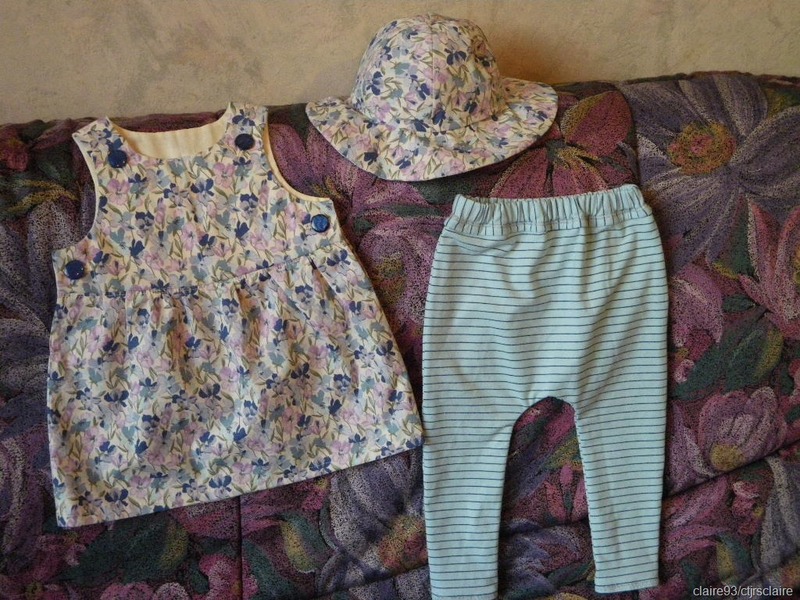 And using scraps for the first two items, so an excuse to link up with Gun and Kate! First up . . . 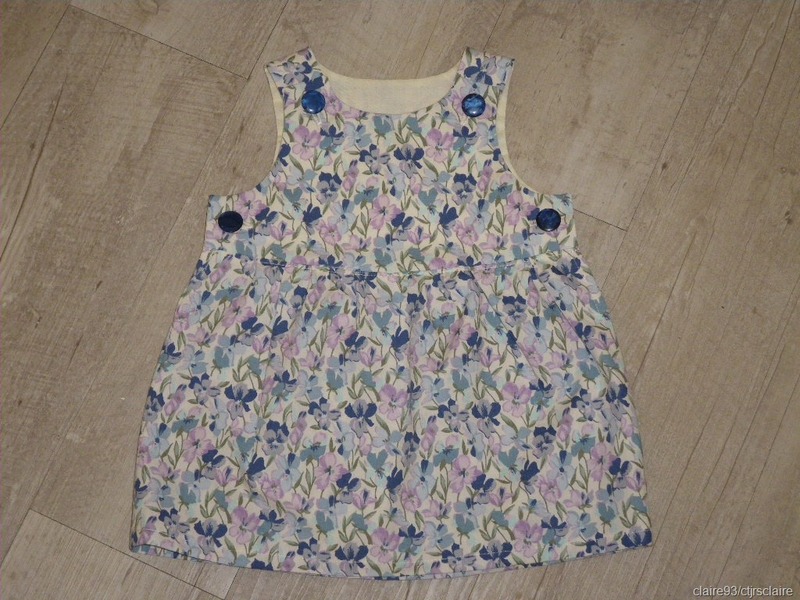 I made a little pinafore dress, using pattern NewLook 6970, and leftover fabric from a summer tunic I made myself a few years ago. Buttons, came from the family button box, and I learned they were originally from the husband’s grandmother’s button box! The husband affectionately called her “Bonne Maman” which is the title I have asked to be called by Baby Viking, when she’s old enough to talk. 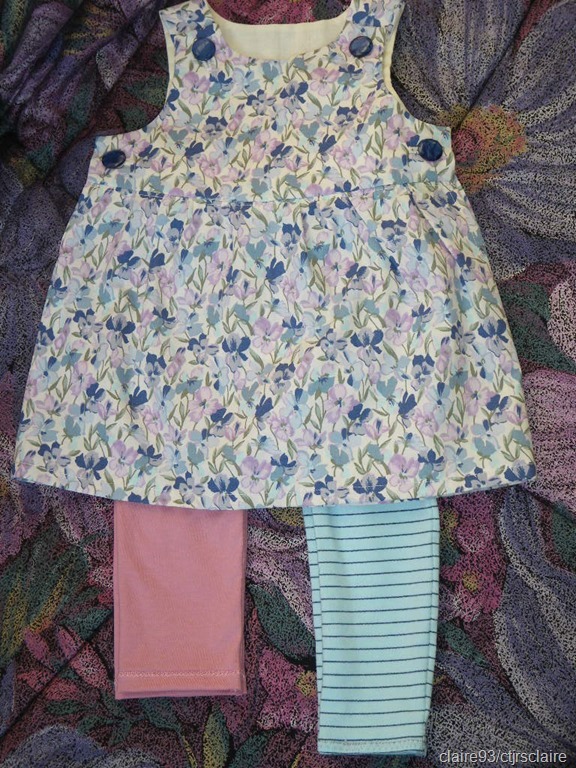 How lovely, I thought, that as the newest Bonne Maman, I should have used buttons from Bonne Maman senior’s button box! Meaning that this little dress was made for Baby Viking by one grandma, with buttons that came from her great great grandma’s button box! 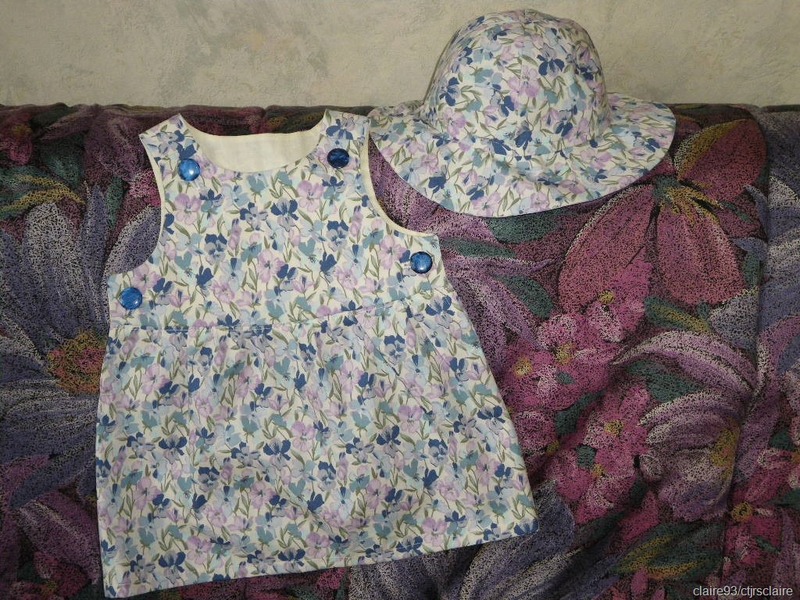 With the very last bits of the pretty floral fabric, a matching sunhat, using NewLook 6274. Husband kindly pointed out to me that one leg is longer than the other – thank you darling! 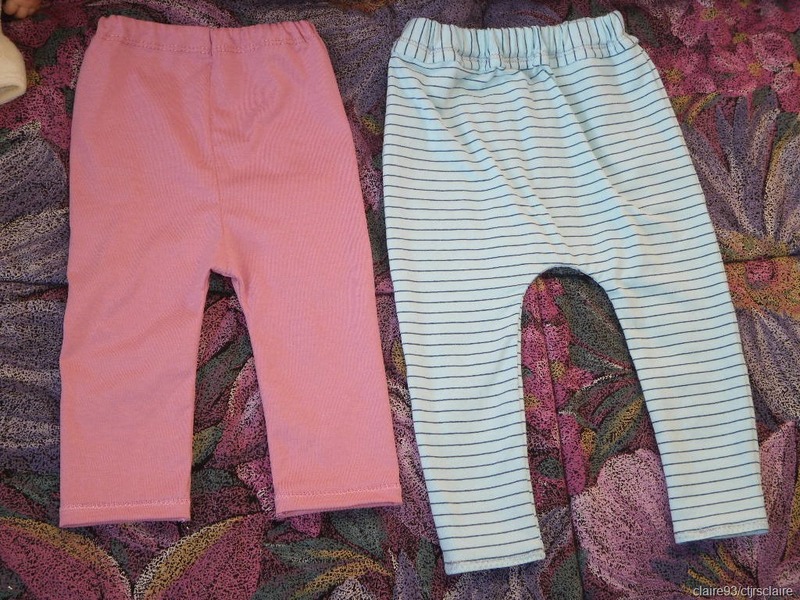 But I’m sure once they’re on (assuming they fit) and Baby Viking is crawling around, no one will notice. I thought they’d look rather pretty with the pinafore dress. Both “bottoms” were made from adult Tshirts. The stripey pair, from one of my too small Tshirts that was otherwise destined for the Red Cross clothes bin. The pink pair were made from a brand new adult Tshirt I bought in Noz for only 1€. And, if you think the waist band looks neat on those, it’s because I used the original hem of the Tshirt bottom as the channel for the elastic waist band. Anyway . . . here are links to other ScrapHappy posters. After the success of my first ever shirt . . . I was on a roll, and decided to try one of the trouser patterns I’ve had in my stash for years. Namely: NewLook #6399. Pattern cover states “easy 2 hour” . . . with the little asterix lower down, specifiying this is “sewing time only per item” lol. There were only 4 pattern pieces to pin and cut out, so preparation didn’t take forever, and surprisingly neither did the sewing together! I did make the job slightly harder for myself than I needed to though. Rather than cutting into any of the bought fabrics in my stash, I picked an unknown fabric, that I inherited from MIL. Not the slightest idea what it was, although I suspect it’s what’s called a “Jacquard” fabric since it looks woven not printed. 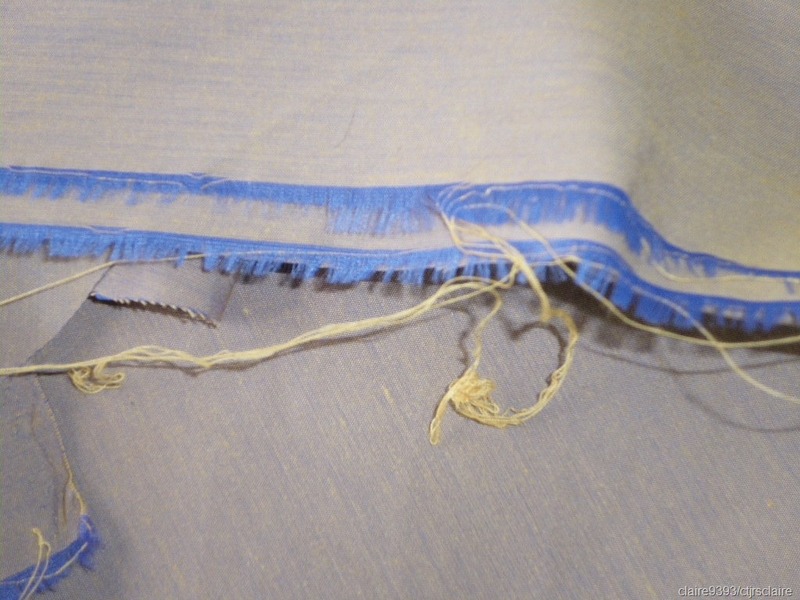 The raw edges had all this blue & yellow thread escaping, but the fabric itself looks beige, from a distance, with shimmers of blue depending on what angle you look at it. Anyway . . . while pressing before pattern cutting, it seemed okay with a hot setting on the iron, as long as iron didn’t stay on one spot for too long. Some scorching happened later in the making process . . . so I’m guessing it’s not cotton lol. Whatever it is, it wrinkles quite a bit. Frays abominably, and all seams had to be overlocked . 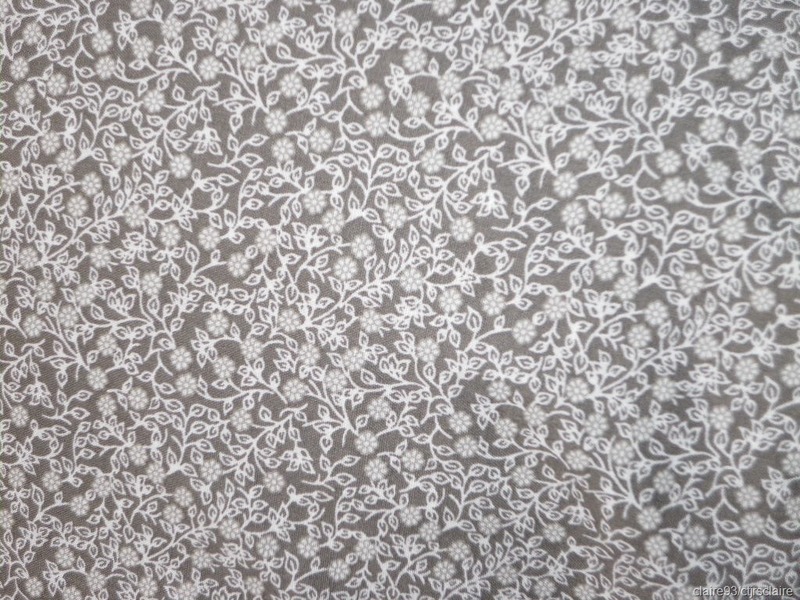 . . but I was determined to use it for my first attempt with this pattern as my “toile”. Pattern sizing had me somewhat confused. 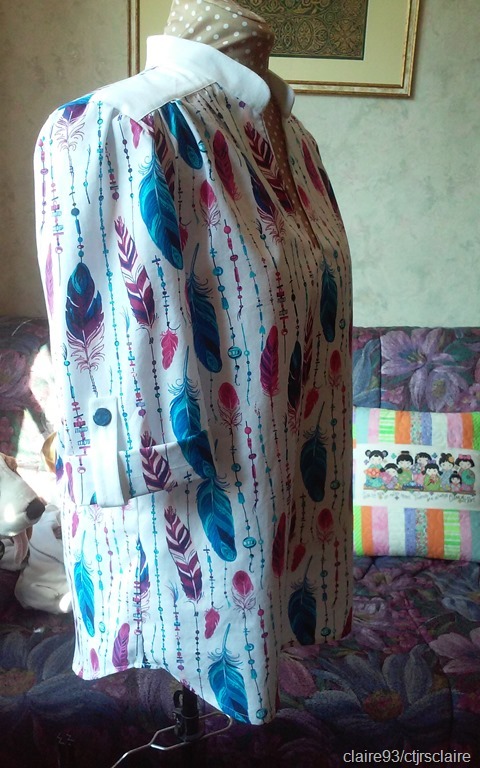 It has “Misses” sizes (like the shirt pattern) so I ended up just getting out the tape measure and cutting out the size which corresponded to my hip measurement. That (sadly) was the largest pattern size (EU 42 or FR 44). Rather too large than too tight, is my motto! As always . . . I didn’t follow the pattern completely. 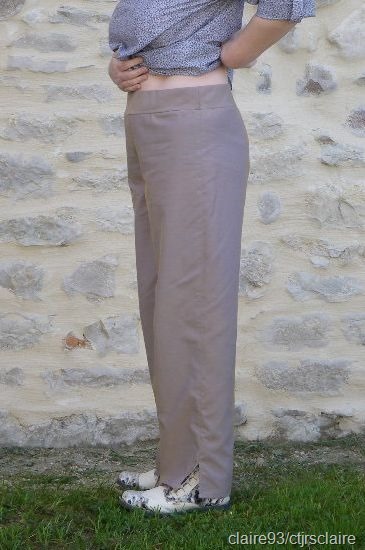 Was making view A (the full length trouser version) but didn’t see the need for the ribbon in the waist band. That band is there to encase 5cm wide elastic. I honestly didn’t see why I would need a draw string ribbon in as well. Especially since that would just make for volume under a top. Anyway . . . one serious sewing session of about 3 hours. 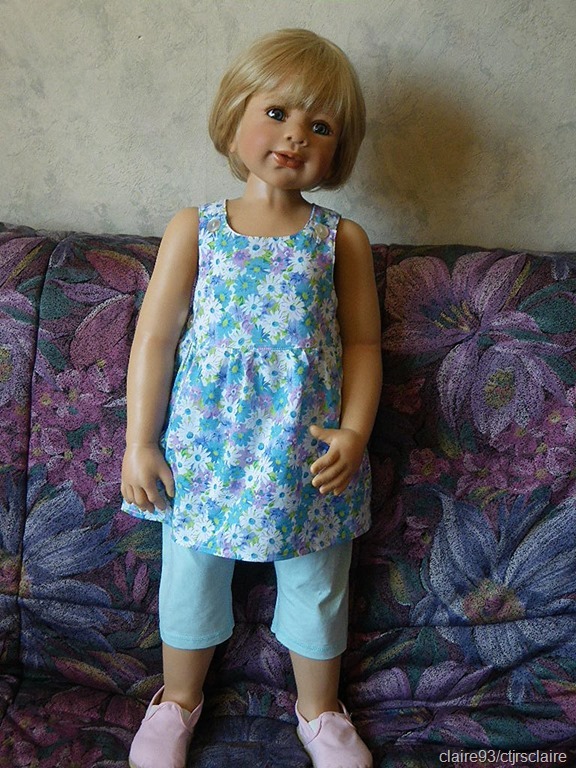 Followed by an hour’s sewing the next day to finish off hems . . . and I have a pair of very comfortable pull-on trousers! [For Tialys . . . I also seem to be related to David Nivon aka “The Brain” lol. Not sure why my head is always cocked to that side for photos]. 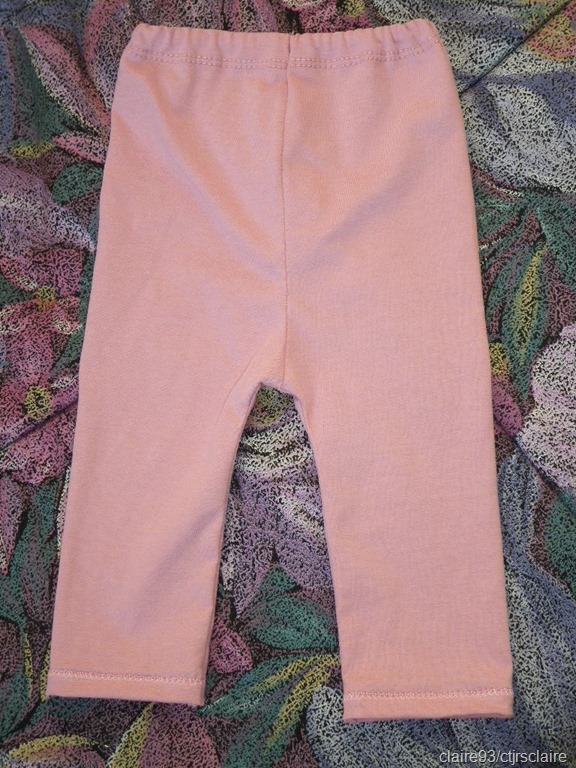 This second photo to show the waist band, which isn’t actually on waist, as pattern stipulates “worn 1 inch below waist”. Not quite sure I see the point in having the open flappy bits at the ankles. Maybe my fabric is too lightweight, but all that opening does is make the leg hang funnily. Maybe I’ve left the hem too long? Anyway . . . I am glad I didn’t bother with the extra draw-string ribbon bit. Trousers sit nicely with just the wide elastic. And, in case you’re wondering, because I certainly was . . . the pieces of fabric for the elastic casing are cut on the bias. So even in a non-stretchy fabric like this one, the band has just enough stretch to pull trousers up over bum and then sit 1” below waist, comfortably, where hips (and love handles) prevent trousers from falling down lol. 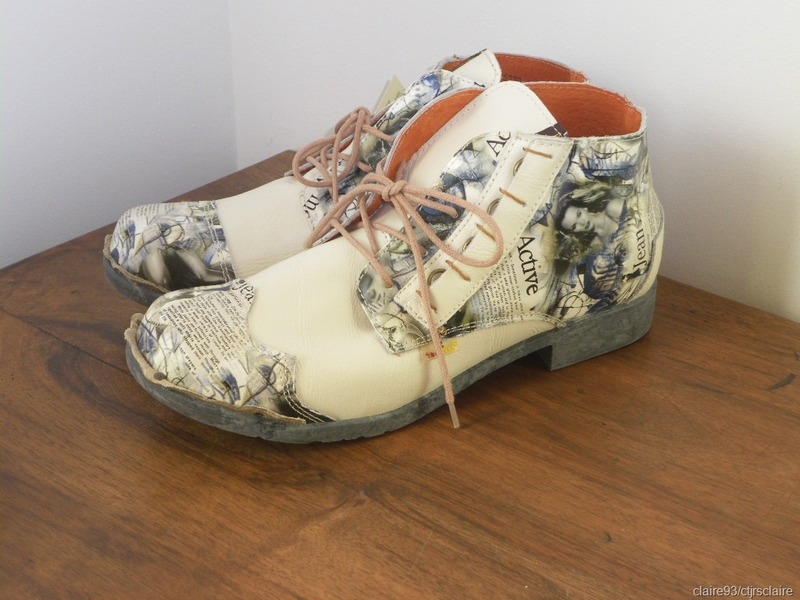 Please note new shoes also! I found this pair of TMA “desert boots” in Noz the other week, priced only 15€ and they fit, so I grabbed TWO identical pairs. I think they’re lots of fun! Well, a lot more fun than wearing mens’ black trainers all the time. I’ve got my orthopedic insoles now (to be worn religiously for at least 12 months until my next check-up) and since these are a German brand, they size up nice & wide, so I can get insoles AND feet in without too much of a squeeze, provided I wear pop-socks. Before I sign off for today . 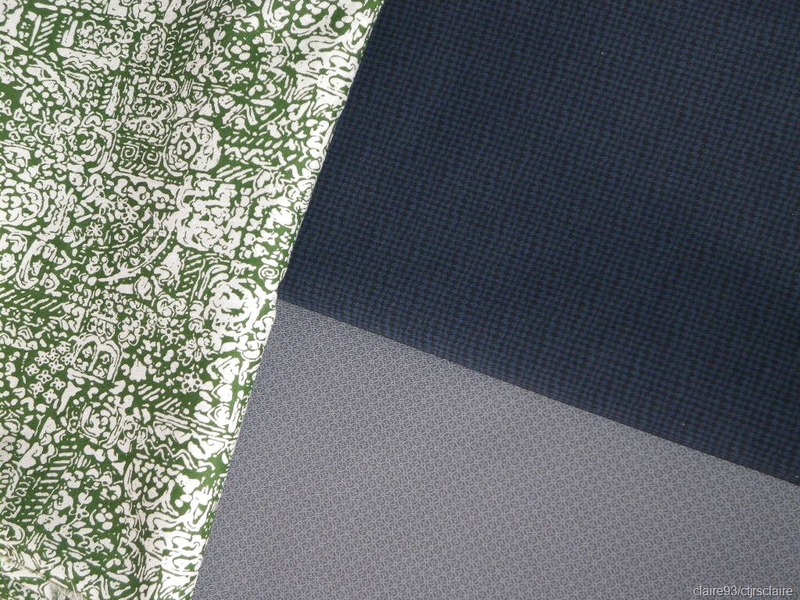 . . I’ll leave you with a photo of 3 new fabrics bought recently, with a mind to another shirt and more trousers (maybe with a zip fastener next time!). 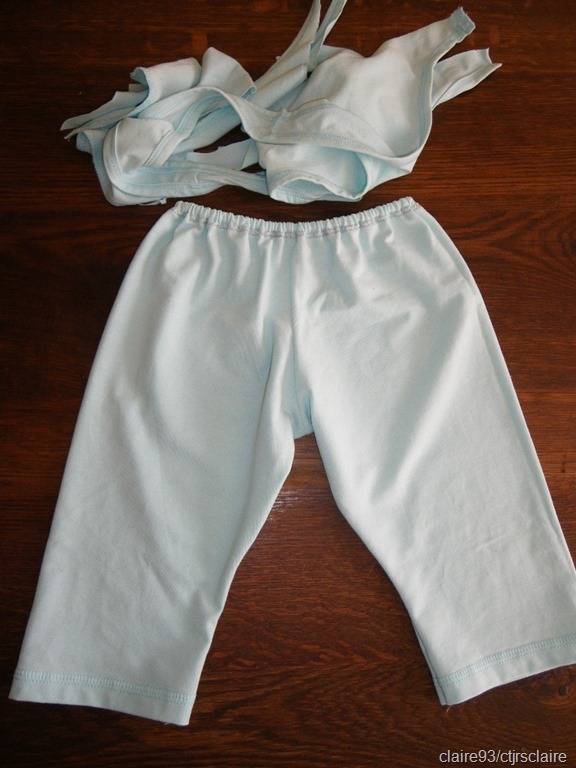 The green & white print is a polycotton. I grabbed that because it was only 5€ for a 3 metre length. Total bargain! And the other two are cotton (with 4% elastathane) gabardines. 15€ for 3 metres of each . 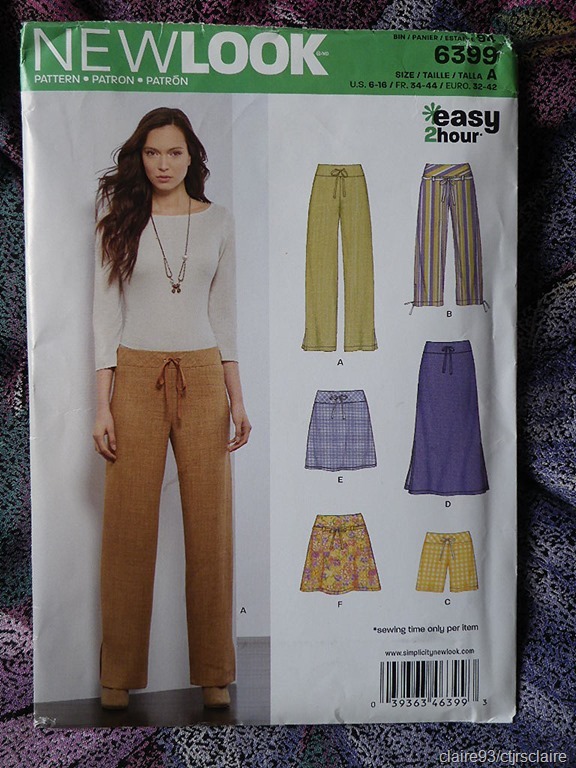 . . I’m seeing two pairs of trousers and one polycotton shirt, with maybe a pair of polycotton shorts for this summer. We’ll see! After probably more than a dozen sewing projects, where I’ve managed to steer clear of sleeves, I decided it was time to give sleeves a whirl. I’ll admit that watching Season 5 of the GBSB helped to get me motivated. That, and the fact I’ve had the following pattern and fabric in my stash since 2016. 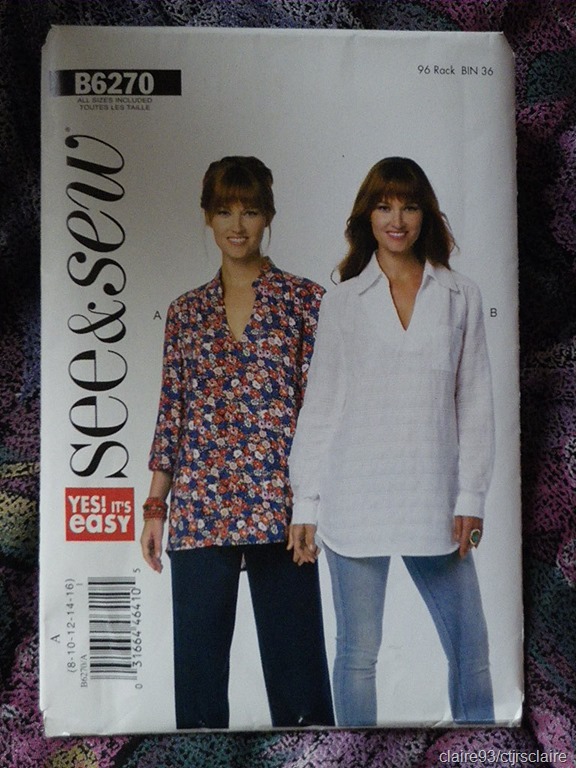 Pattern being B6270 SEE & SEW, with the comforting red logo reassuring me that “YES! It’s easy”. And fabric being 1.5m of a very light-weight 100% cotton: Minimals designed for Poppy Europe. I can’t remember now where I bought it, nor how much I paid for it. 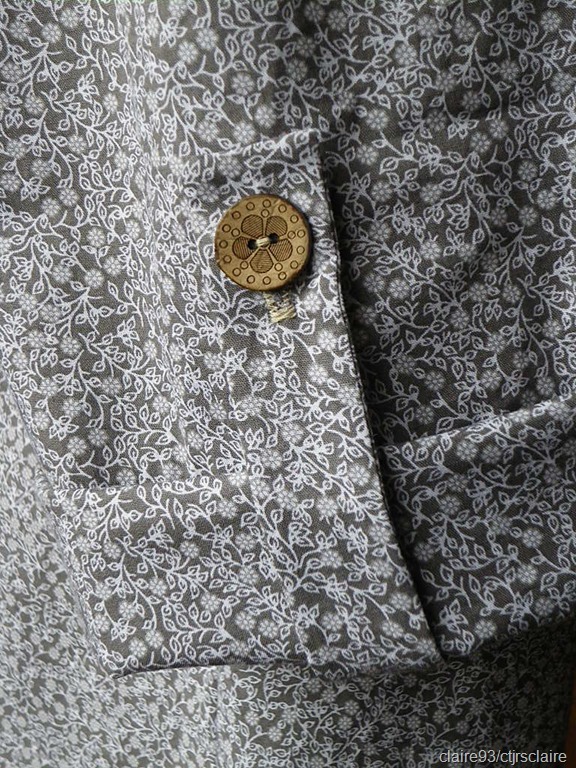 All I know is, I bought it with this specific pattern in mind, seeing it sewn up to make shirt A, with the grandad collar and the turned up sleeves. Just as well the pattern claimed it was easy, because that’s what gave me the courage to go ahead. On hindsight, “easy” isn’t the adjective I would have used . 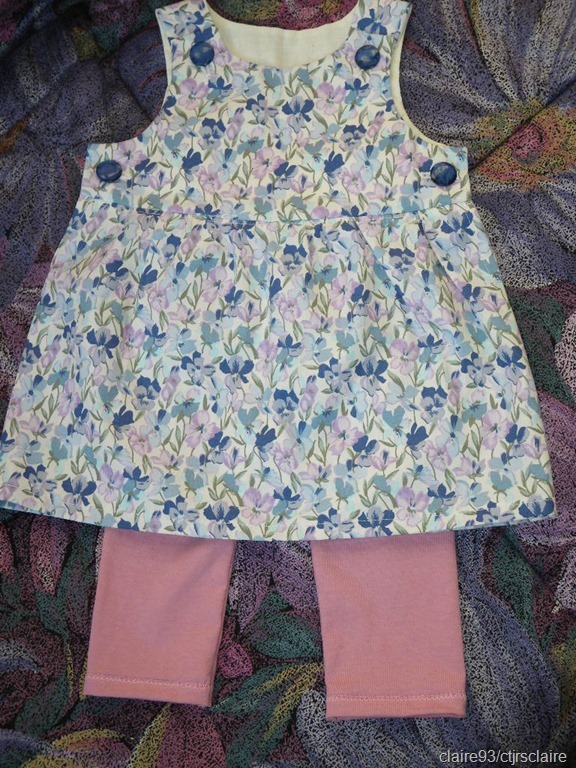 . . but it was do-able with lots of patience and a seam ripper to hand. 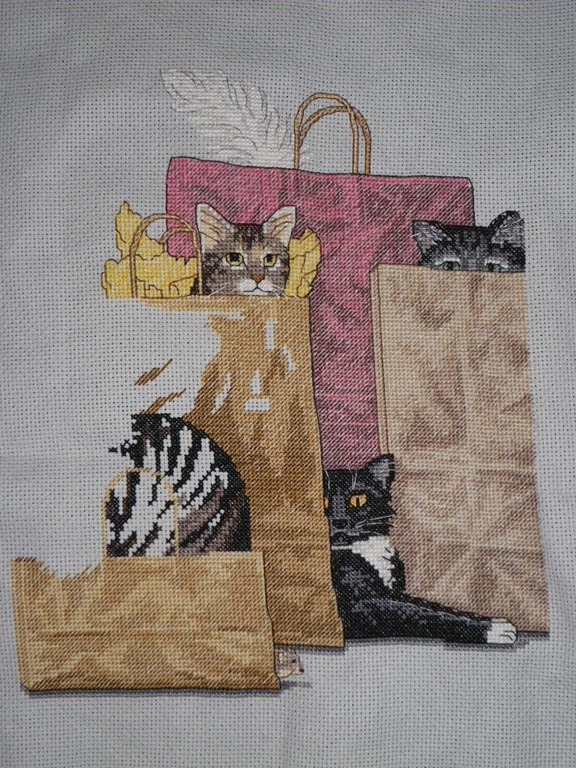 Four afternoon sewing sessions it took me . . . with various mishaps along the way. I managed to sew front facing on the wrong way round, only discovering after I’d trimmed seam to turn. Fixed that! Had loads of trouble working out the correct way to sew on my collar. Sewed once. Didn’t look right. Unpicked. Sewed a different way. Defintely didn’t look right. Unpicked. Emailed Avis for help. Discovered I’d done it correctly the first time. 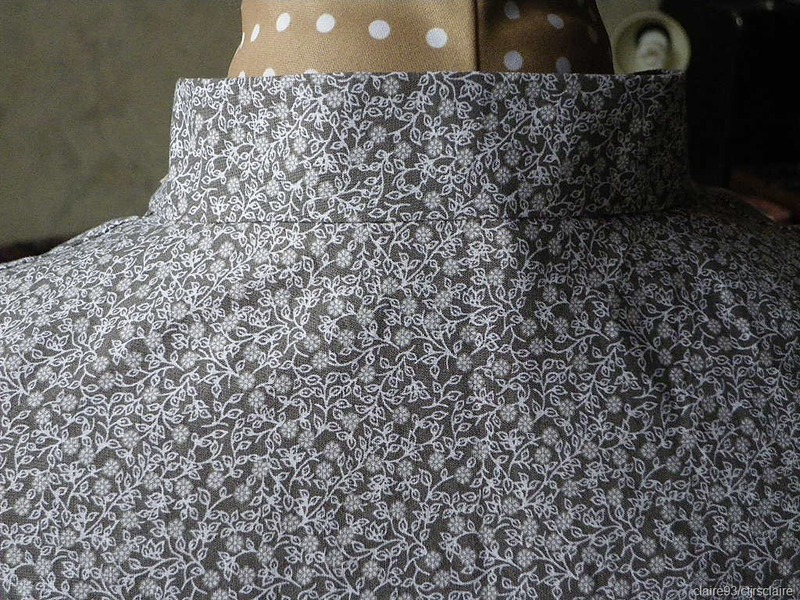 So sewed collar on for the third time. Sleeves were also a challenge. But they’re in. And I made a slight modification to the pattern which called for version A to have special cuff loopy bits sewn into place . . . 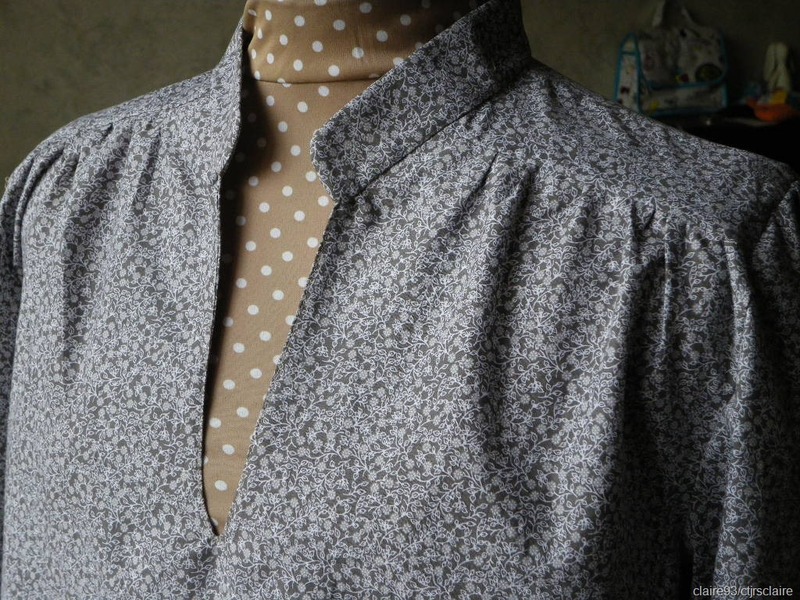 I chose to add a button and button hole to mine, so sleeves can be unfolded when being washed & ironed. And I have to say . . . 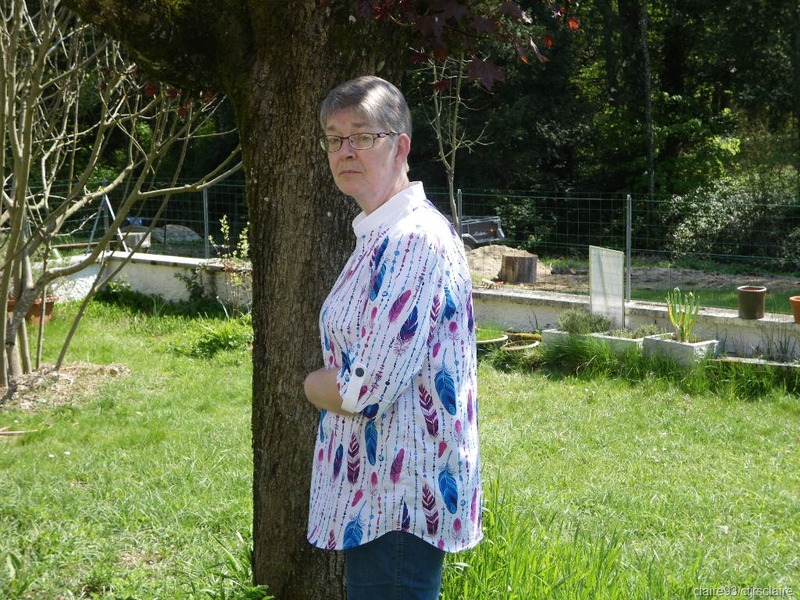 I am thrilled to bits with my first shirt! Oh, other alteration I made . . . 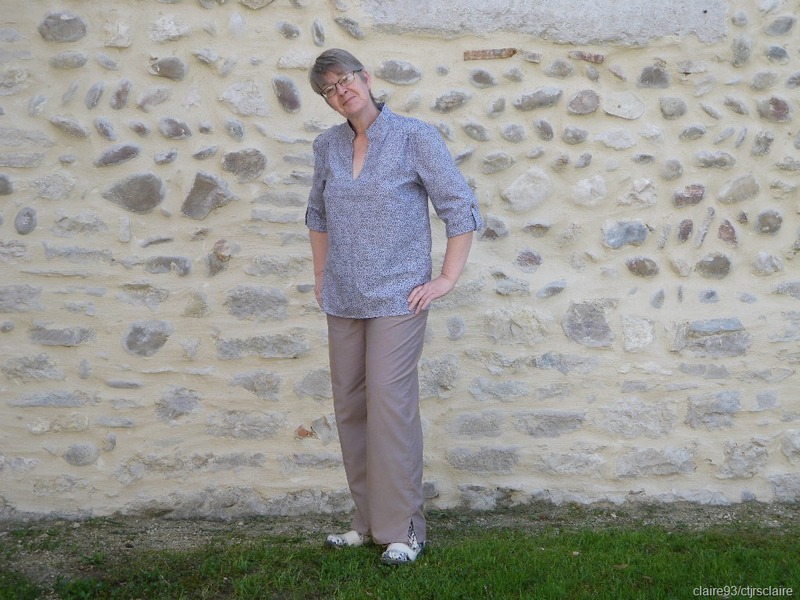 I didn’t like the shirt-tail hem line, so mine is straight across, both back & front. 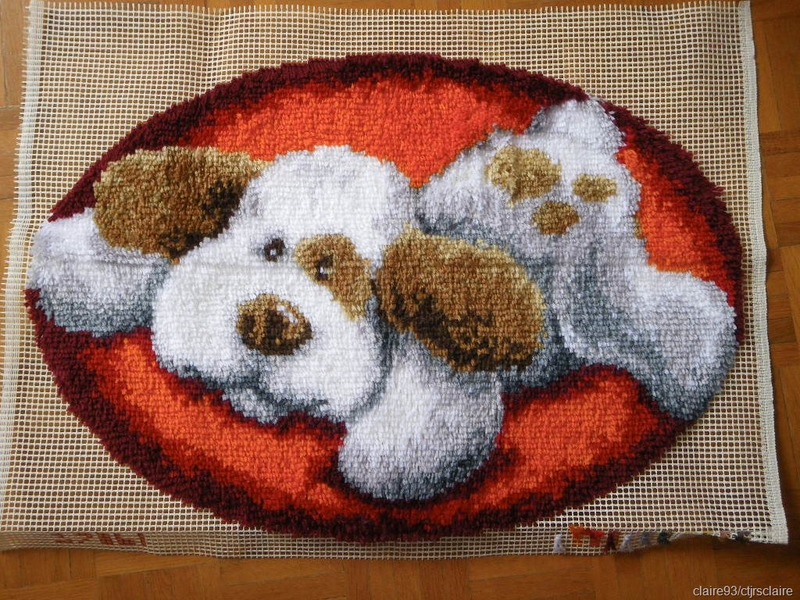 I will definitely be making this pattern again! Version B pointy collar & pocket don’t tempt me, neither do the full length sleeves with proper cuffs . 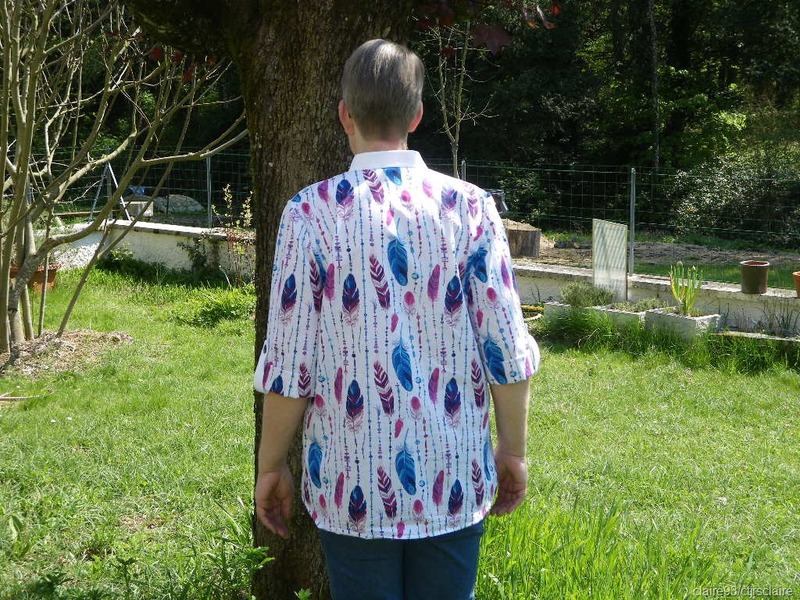 . . but I might try curved shirt tails next time, just to make it longer, and to give myself a new challenge. Another 3 weeks have flown by . . . which means it’s time to post progress photos for my SAL project. Not bad, even if I do say so myself! 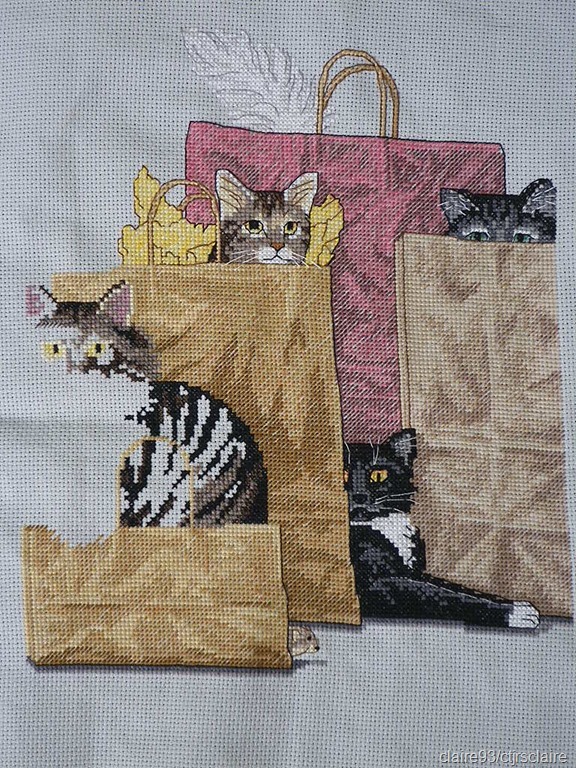 A fourth bag complete, and a fifth cat (the largest in this project) gradually taking shape. 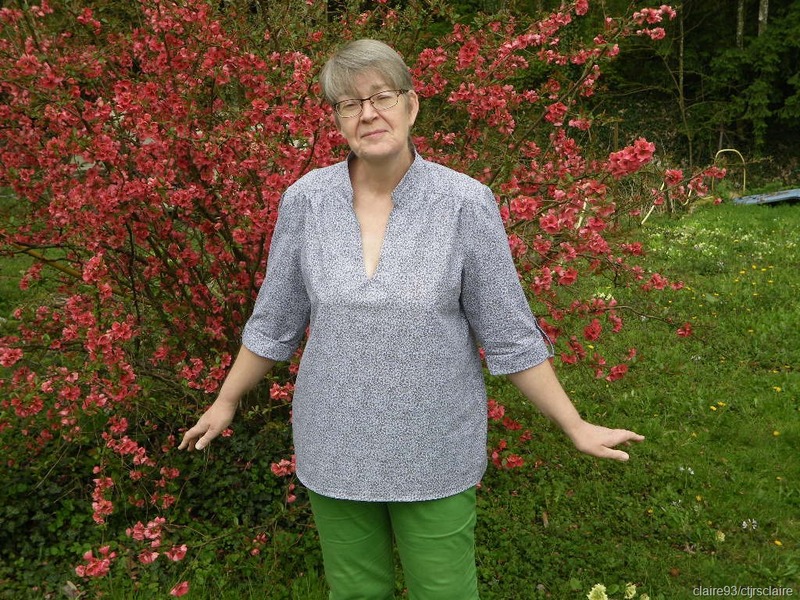 Let’s do some blog-hopping, and see what other members have been up to! And we’ll be back again on 28th April, with yet more progress. Our hens have been a right handful this month! 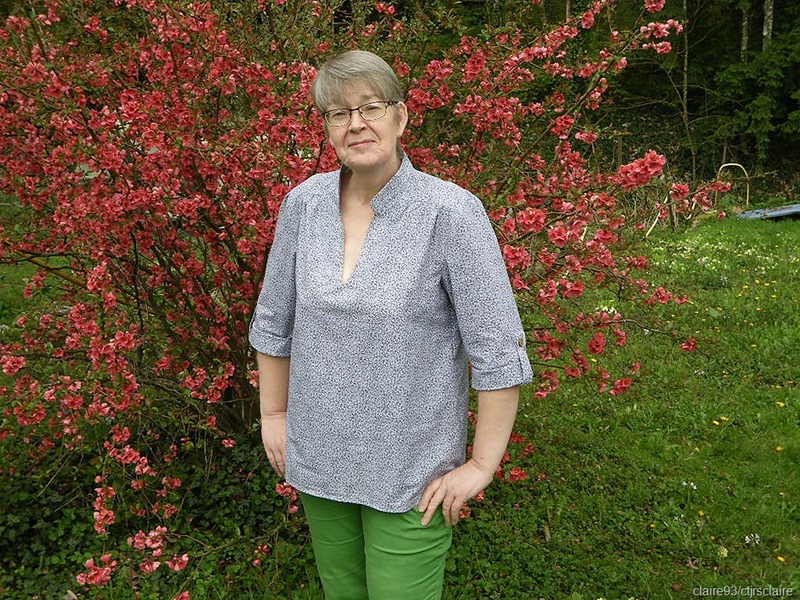 They’ve taken to escaping from their enclosure on a daily basis and causing havoc in the veggie garden, where the husband is trying to prepare plots for plantations. We appreciate that they’re currently living on bare soil, with a covering of straw, and that the grass must look so much greener on the other side. They did have grass on this plot in February, but soon pecked & scratched it clean, and it’s a bit early in the season for us to move them to their summer residence in the orchard. Try as we might, we were unable to see exactly how they were getting out, but get out they did. Every single day, this month, I’d pop out to take them their treats, only to find they’d been having fun: digging in the strawberry patches, and burying the poor plants; having sand baths in the beautifully banked mounds where the husband is trying to grow asparagus; having a good old rummage in the compost heaps; and generally running riot! 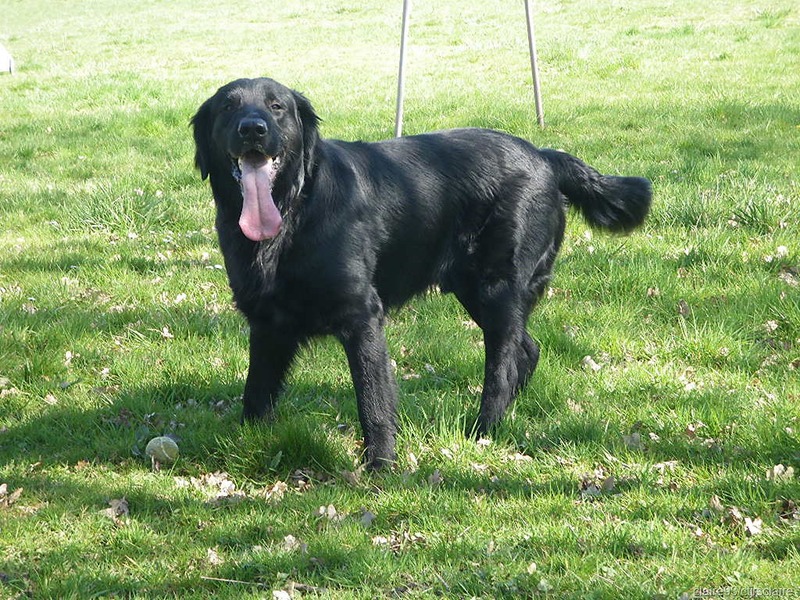 We checked there were no gaps at ground level, where they could be sneaking out under the net fencing. 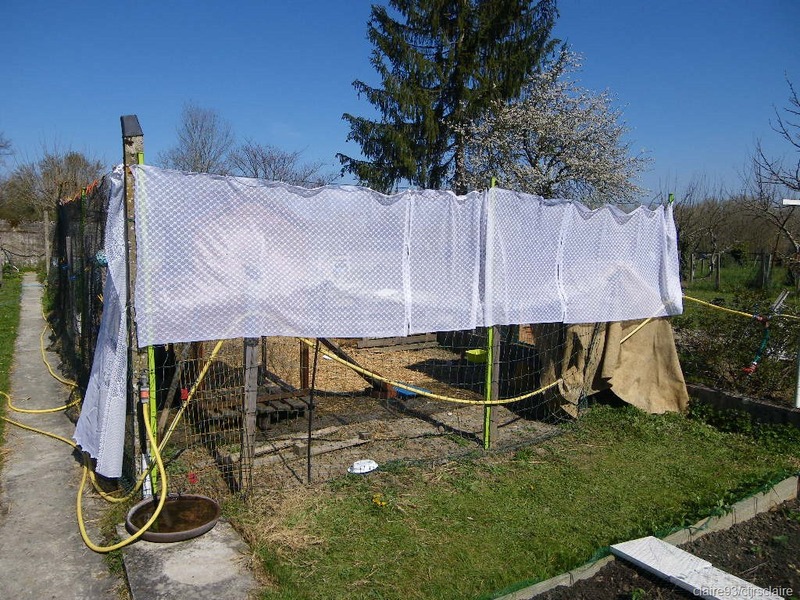 Hung extra netting higher up along 2 sides of the enclosure . . . and I did some more feather clipping on left wings. In a final attempt to keep them inside their park . . . 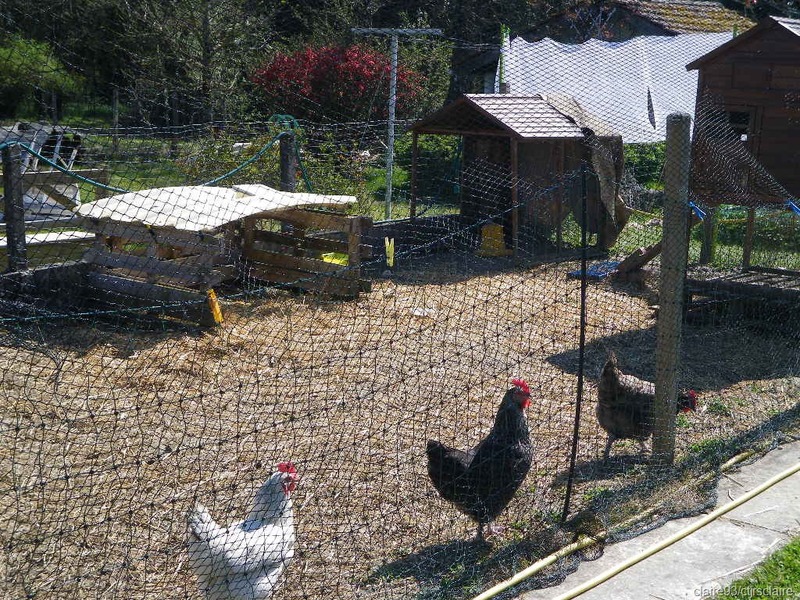 I ended up re-purposing some of old net curtains because we’d run out of proper fowl netting, and I didn’t want to have to go and buy some more. The result looks rather strange, to say the least. But we’re hoping it’ll do the job of stopping hens from doing more of their Houdini act. Anyway . . . not only have they been escaping on a daily basis, they’ve also all been laying on an almost daily basis. 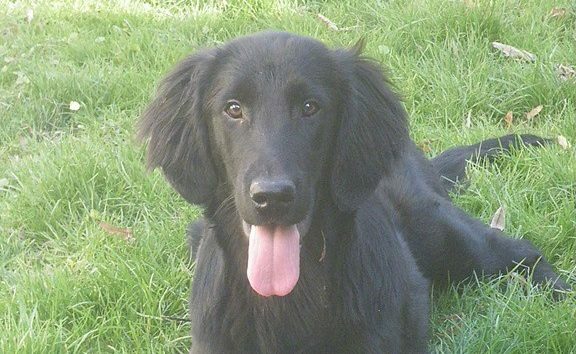 This month saw us with a total egg count of 86. 28 from both Miss Plumpton and Miss Moneypenny, while Mauricette laid a massive 30 eggs.